Construction status for NY Route 347 & NY Route 112 in Terryville and Port Jefferson Station areas. Terryville/Port Jefferson Station, NY - September 29, 2014 - Today, Senator Ken LaValle released a New York State Department of Transportation update for the road construction for NY Route 347 & NY Route 112 in the Terryville and Port Jefferson Station areas. Senator LaValle requested a formal project update from the Department due to the ongoing inconvenience to the public. NYSDOT appreciates your continued patience during construction along NY Route 347 and NY Route 112 in Terryville and Port Jefferson Station. This is one of a series of Green Route 347 corridor projects planned to improve safety for motorists, bicyclists and pedestrians and reduce travel delays by transforming NY Route 347 into a modified boulevard and suburban greenway for 15 miles through Brookhaven, Islip and Smithtown. Throughout the project development stages, NYSDOT’s partnering with local residents, businesses, public officials, and community groups has been the foundation of the project's development and the basis for its evolution into its current form. This Project Update will provide the current status of construction operations. The purpose of the project is to construct a jug handle along Rose Lane/Canal Road/Sylvan Lane in the southeast quadrant of NY Routes 347 and 112, and along Jayne Boulevard in the northwest quadrant in order to relieve traffic congestion at these intersections as well as reduce fuel use and vehicle emissions. 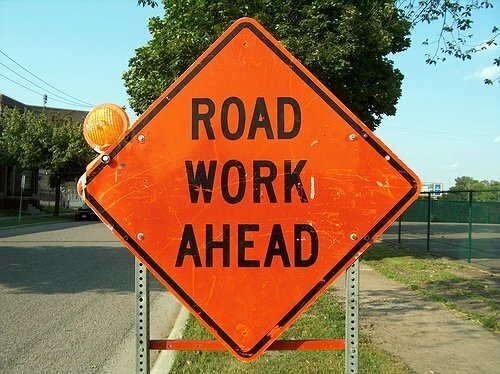 The limits of work for the current project on NY Route 347 are east of Terryville Road to Davis Avenue. The improvements along NY Route 347 will include three travel lanes in each direction, raised medians, left turn lanes, continuous sidewalk on the north side and a separate shared-use path for bicycles and pedestrians on the south side. Other elements include pavement reconstruction, a positive drainage system, landscaping, bus shelters and utility relocations. Temporary signs were recently installed to assist drivers in accessing shopping centers affected by the construction operations. A driveway entrance to a strip mall at Jayne Boulevard was added at the request of the businesses for easier access by the public. Landscaping designs at a proposed recharge basin have been revised in front of the Pathmark Shopping Center based on a request from the Port Jefferson Station/Terryville Civic Association. In addition, trees were removed between the newly constructed recharge basin and parking lot of the Meat Farms shopping center at the shopping center’s request. A new traffic signal and system were installed at the request of the Terryville Fire Department to allow their dispatcher to control traffic signals on Jayne Boulevard and NY Route112 for their emergency vehicles and fire engines. Construction drainage operations at the Snow Shed business were completed. In addition, the fence off of Lamport Road at this location was removed with assistance of the NYSDOT contractor to improve access and a proposed driveway was relocated at the business’s request. Work has been coordinated with the Town of Brookhaven’s Canal Road improvement project, which will add curbs, sidewalks, signs and milling and filling with asphalt on all and/or parts of Canal Road to County Road 83. A highway work permit between the Town of Brookhaven and NYSDOT was issued so that a temporary driveway to the North Brookhaven Chamber of Commerce’s Train Car can be maintained. Construction of the access driveway is near completion. The jug handle will be opened by the end of October, 2014. All of the significant work east of NY Route 112 will be completed before the Thanksgiving holiday. Access to all commercial properties has been and will continue to be maintained with at least one driveway opened to all facilities at all times. Weather permitting, the contractor will continue drainage and any other appropriate work throughout the winter. All of the surface work on NY Route 347 from Terryville Road to NY Route 112, including pavement, curbs, sidewalks, shared use path, center median barrier, landscaping, signs, pavement markings, etc. will be completed by the end of spring 2015. NYSDOT staff is available to answer questions and address concerns until project completion. Please contact Edmund Donovan at (631)509-5129. Subject: LongIsland.com - Your Name sent you Article details of "Senator Ken LaValle Releases State Department of Transportation Project Update"